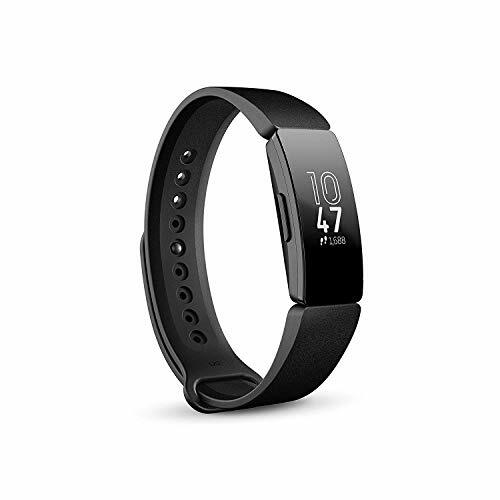 The Fitbit Inspire is a slim, stylish and waterproof activity tracker that offers a great performance in the features it offers, whilst also offering numerous accessories to change the look. We'd recommend spending the extra money for the Inspire HR to really get the most out of Fitbit's excellent platform and everything it offers though. Fitbit recently replaced its Zip, Flex and Alta activity trackers with the Inspire family. There are two models in the Inspire range - the Inspire and the Inspire HR - with the former being the one on review here. The Fitbit Inspire offers basic activity- and sleep-tracking for a little less money than the Inspire HR, but it misses out on a number of features, not only the heart-rate monitoring as indicated by the product name. Is the Inspire still an, um, inspiring option to consider if you're after a simple activity tracker? The Fitbit Inspire offers a very similar design to the slightly more expensive and more capable Fitbit Inspire HR. In fact, at first glance you'd be hard pushed to tell the difference, apart from the colour variations. The Inspire is around 3mm slimmer than the Inspire HR, and while it sacrifices a heart-rate monitor for this reduction, it is more comfortable to wear than the Inspire HR as a result. It doesn't need to be worn as tightly as the Inspire HR to sit flush to the wrist due to this lack of HR monitor, while the lightweight plastic build makes it barely noticeable when on. The plastic build makes for a less premium looking device than the Charge 3 and Alta trackers. The Inspire is waterproof (but somehow lacks swim tracking) - something the Alta and Alta HR missed out on - which is great should you end up getting drenched or jumping in a pool while still wearing it. A curved OLED display dominates the top of the Inspire, but it offers something a little extra to the HR variant. We've reviewed the Sangria model and its display has an all-over pink tinge to match with that colourway. It won't be to everyone's taste but we like it for being that bit different. The black variant has a standard display for those who aren't into pink text. The display itself is only 50 per cent of the space it occupies however, leaving large bezels at the top and bottom. We'd like to have seen a bigger display to make more use of the space, but the text is crisp and the display delivers ample brightness - even when outside. The touchscreen is responsive too and there is a single button on the left for waking up and putting the screen to sleep, as well as returning to the main screen and accessing settings. Like the Inspire HR, the Inspire's plastic body tapers in towards the wrist and there are interchangeable straps, with a spring pin system allowing for a simple swap to one of the other bands available, which include leather and metal options for a smarter look. As standard, the Inspire comes with a silicone strap - but unlike the Inspire HR it's fastened with a pin and loop mechanism (same as the Alta and Alta HR), which is a little harder to adjust and not as secure as the buckle fastening. We didn't have any issues with the Inspire unfastening, but we prefer the buckle for peace of mind. The Fitbit Inspire might look very similar to the Inspire HR but it only offers a fraction of the features. All-day activity- and sleep-tracking are on board, as well as female health tracking, and the Inspire has Fitbit's SmartTrack feature for automatic exercise recognition too - but that's pretty much as far as its features go. Activity tracking includes steps taken, calories burned, distance travelled and active minutes, while sleep tracking includes time awake, time asleep and time restless. There's no advanced sleep stages like you get with the Inspire HR though and there's no exercise modes on the Inspire either - so you can't manually force the Inspire to record a bike workout, for example. Connected GPS, heart-rate monitoring, Guided Breathing sessions and Cardio Fitness Level all lack, whereas the Inspire HR offers these for just £20 more. Swim tracking isn't available either, despite the Inspire offering waterproofing to 50 metres. Despite its pretty basic activity tracking features, however, the Inspire does offer smartphone notifications, reminders to move, timers and alarms - so there are a few useful attributes. The Fitbit Inspire is a basic activity tracker. As long as your expectations are managed then it's a great device, delivering good performance in all the features it does offer, even if these are fewer than we'd liked to see. Step counting and distance travelled on the Inspire is near enough on par with the Apple Watch Series 4, which isn't bad given the Apple Watch is four times the price. Meanwhile, calories burned are underestimated on the Inspire - but we'd expect this given the Apple Watch has a heart-rate monitor and the Inspire doesn't. The Inspire's automatic exercise recognition works well and smartphone notifications are good too, working in the same way as the Inspire HR by mirroring your phone. As soon as a notification comes through from a specific app, like WhatsApp or Facebook, this app will then appear in a list in the Fitbit app, allowing you to toggle notifications on or off for each respective app. Battery performance is also good on the Inspire, offering the full promised five days without needing a top-up. Charging takes place via a special dock so there's no Micro-USB or USB Type-C convenience here, as usual with Fitbit, but it's by no means as fiddly as the Charge 3 and Alta devices with their clip docks. The Fitbit Inspire connects to the Fitbit app, which is one of the best in the market in terms of usability. It delivers information in a clear and concise format and it's easy to use and understand. For current Fitbit users, switching over to Inspire is nice and simple and if you're moving over from the Alta or Flex 2 then you won't miss out on any features, apart from swim tracking with the Flex 2. You'll just need to setup your new device and all your past data will still be visible. For those new to Fitbit, setup is super easy and you'll get to grips with the app in no time. Data is shown in the main Dashboard section of the app and tapping on each metric will allow you to delve a little deeper into the details. We won't go into more detail on the Fitbit software here, but you can visit our Fitbit tips and tricks feature for more information on how to get started and how to find everything you might need to ensure you get the most out of your Fitbit. The Fitbit Inspire is a slim, stylish and waterproof activity tracker that offers a great performance in the features it offers, while also offering numerous accessories to change the look. Its biggest problem is the Inspire HR, which offers significantly more features - and useful ones too - for only £20 more. The Inspire only offers basic tracking and basic sleep tracking - and while it does both well, £70 is a lot to pay for what is essentially a pretty pedometer. We love the Sangria model of the Inspire and we really enjoyed wearing it for its comfort and subtlety, but we'd recommend spending the extra money for the Inspire HR to really get the most out of Fitbit's excellent platform and everything it offers. The Fitbit Inspire HR is only £20 more than the Inspire, offering a similar design but a range of extra features including heart-rate monitoring, Connected GPS and swim tracking, to name but a few. It is well worth the extra money. The Fitbit Charge 3 is little more premium looking than the Fitbit Inspire and it comes with a number of extra features like the Inspire HR. It's an excellent device with great activity and sleep tracking, waterproofing and swim tracking, as well as and the option for Fitbit Pay if you select the Special Edition model.